Sasha Randjelovic – Randja – guitars, acoustic guitars. Born in Zemun on November 4th 1968. As a child he showed interest in rock music and got his first guitar when he was almost 10. In time, besides rock music, he studies other music genres (blues, jazz...). As a highschool boy, he makes his first studio recordings at Studio 13 RTB, which were produced by Miodrag Bata Kostic. At this time, he meets Zoran Milin (unfortunately deceased now), frontman of the band called "Malo sutra", who helps him a lot in creating his own style. In mid 80s, Randja plays with less known bands from Zemun. In 1988 he goes to Vis to serve in the YNA and it is here that faith unites him with the Father of Belgrade's Blues, Dragan Markovic - Mare. 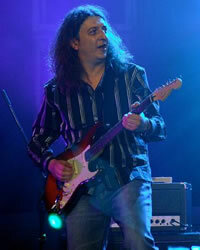 In 1989, together they form the best-liked blues band called "Di Luna Blues Band" and become famous all over Serbia. Their collaboration lasted full five years and their friendship is still on. In 1990, Nikola Cuturilo invites Randja to join his band " Cutura i oblaci". They record an album " Rekom Ljubavi". In 1994, mutually delighted, Milan and Randja meet in "Central Club" in Valjevo at "Di Luna Blues Band" concert. Afterwards, Milan asks him to open the big Rock Spectacle "30 years of Rock 'n' Roll" together with him (concert held at Belgrade's Exhibition Hall 1 in front of 20 000 visitors) A couple months later, in May 1994 to be precise, Randja officially joins "Neverne Bebe". All these years, Randja has been a studio performer for various other musicians. Some of them are: Laza Ristovski, Boris Arandjelovic, John O'Leary, Grale i Vukovi, Billy King, Vlada Marash, Knez etc. He is happily married to Ljiljana and a father of two wonderful girls, Nina and Iva. Recently, his DVD came out: Randja's First DVD Guitar School for Begginers "Electric Blues Guitar".